Certain earrings come into their beauty in summer evenings on patios; the setting sun catches them and the reflected glow flatters your face. No matter what you wear, you'll look enchanting. So let's stow our studs and more discreet earrings for a few months, and have a party on our ears! 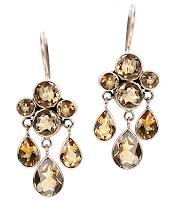 Jane Diaz 10k gold faceted cluster citrine earrings with three tear drops, $410 from Fragments, $410. The differing hues of the stones and harmonious proportions make these classic yet vivacious. Anton Heunis sterling silver amazonite cluster clip-on earrings, $170, also from Fragments. I love the retro feel and jumbled mix on these as much as the $170 price tag. Of course nothing catches moonlight like diamonds. These are can be significant purchases or quite reasonable, thanks to the proliferation of micro-pavé and lower diamond prices. 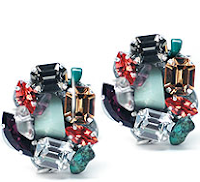 Left, Fabrizio Riva Square by Night Earrings, $2, 050 from Barney's. 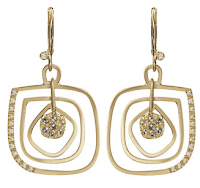 18k gold set with crown-cut diamonds, a 1.65 inch (4.2cm) drop. 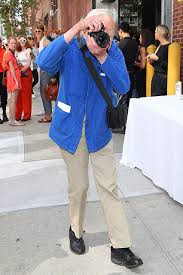 OK, that's my high end fit, but aren't they chic? 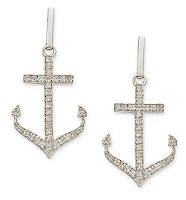 spacegeek recommended Ross Simons in my post about peridots, and didn't I just find a pair of charming diamond anchors set in 14k white gold (with post backs) for only $195 on sale, reduced from $495. At just a half-inch drop, these are small, micro-pavéd dangles, but just right amount of sass with a sw imsuit or jeans. 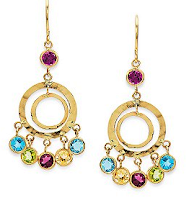 How about these double-circle dangles, with nearly 2 cts of garnet, blue topaz, peridot and citrine on hammered 14k yellow gold? Very wearable 1.5-inch drops of summer lusciousness for $195; also from Ross Simons. How much fun would it be to open the box with these inside? If you are not an earring person, a diamond pendant will also pop your patio outfit. I'm super-picky about pendants, so many are boring. This is an investment piece; if you can find a pendant made in cz that's this beautiful (including the squared-bead chain detail), please send me the link and stand back while I order. In the meantime: from Barney's, Jennifer Meyer's graceful and glittering 18k white gold Diamond Leaf Necklace, $2,775. Jennifer Meyer will donate a portion of the proceeds from the sale of each necklace to Healthy Child Healthy World. My "real" gems run to the semi-precious. I have a few pair of Devon Leigh beauties (my faves being citrine and yellow jade danglies, a gift from mon mari. Lately I've been focusing more on statement necklaces and keeping the earrings minimal, but thanks for the reminder. I'm going to pack some ear candy for my trip. Love the pretty earrings. Your earring posts have really sparked a search for pretty new earrings this year. Thank you for all the wonderful inspiration! I don´t own lots of jewelry. Less is more, that´s my motto. Diamonds for ears. Btw., that white gold pendant is charming. We´re I there, I´d probably even buy it for myself. Thank you for sharing. Pseu: Love citrines; am planning a post dedicated to them. Mardel: Thanks, I think updating earrings is a fun way to update a wardrobe and look chic. metscan: Stay tuned for a post on diamonds soon! Citrines are my birthstone but I have nothing I like in citrine ( I keep my sweet sixteen citrine ring in a box only for sentimental value!) Those Fragments earrings are gorgeous however. Good to see more on citrines coming up. A party in your ears - what a lovely expression. I love dangly earrings! I am particularly partial to coloured pearl ones and have a number them in different colours. Duchesse--I always wore real jewelry, but now that I am over 50, I am happier with costume. Why is that? 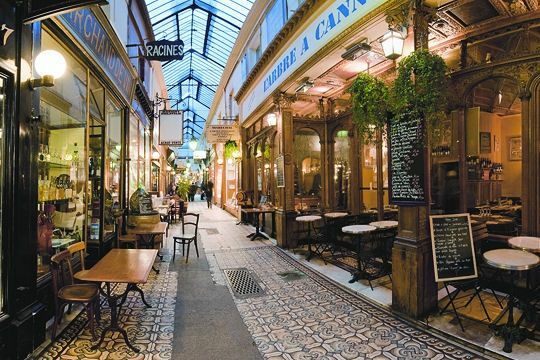 Frugal: You're asking ME? (LOL). 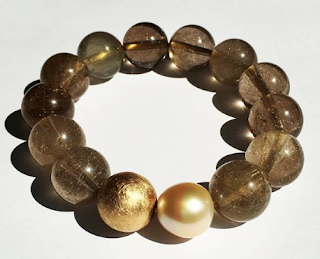 Perhaps you now like bolder jewelry and so the real would be very expensive (think of Michelle Obama's gumball pearls), and you don't choose to spend there? You can find some real jewelry (like freshwater pearls with silver) very reasonably, even for a frugal guru. Alienne: Coloured pearl dangles, one of my favourite things!